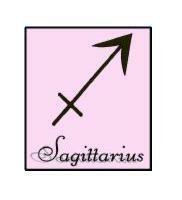 This page details Sagittarius Traits, dates, symbols, and personality profiles. Scroll down to view a nice collection of free printable designs pertaining to the Western Zodiac sign of Sagittarius. To see a profile of the Sagittarius personality and assorted other related free printable items, click any of the links on this page. Shown above is the symbol for Sagittarius. Other Sagittarius clip art designs are shown below. Clip art, in the graphic arts, refers to pre-made images that are often used to illustrate correspondence, web pages, artwork and other visual projects. Today, clip art is used extensively in both personal and commercial endeavors. To print any of these images, just right click on the chosen image and select a SAVE option from your drop down menu. This will bring the image to your picture file, where you can reduce or enlarge it and adjust the margins as needed before printing. Use these images to adorn your stationery, design a logo, enhance your artwork, jazz up a web page, or for just about any other purpose you can imagine. People born under the sign of Sagittarius are generally believed to be sunny and optimistic. As a result, they can sometimes be reckless and irresponsible. Still, their curiosity can be charming, and they have a general love of travel. Career choices suitable to people with Sagittarius personalities include customer service rep, tour guide, explorer, teacher, and self employed professional of any kind. People born under the sign of Sagittarius are thought to be most compatible with Aquarius, Leo, Pisces, and especially Aries. The Western Zodiac sign of Sagittarius falls between the dates of November 23rd and December 21st. Topaz is the "starstone" representing the sign of Sagittarius (different from a birthstone, which symbolizes a calendar month). The colors most often associated with the sign of Sagittarius are blue, deep purple and black. Appropriate gifts for Sagittarius personalities include scratch-off lottery tickets, gourmet foods, beauty products, trips to exotic places, and tickets to exciting events.